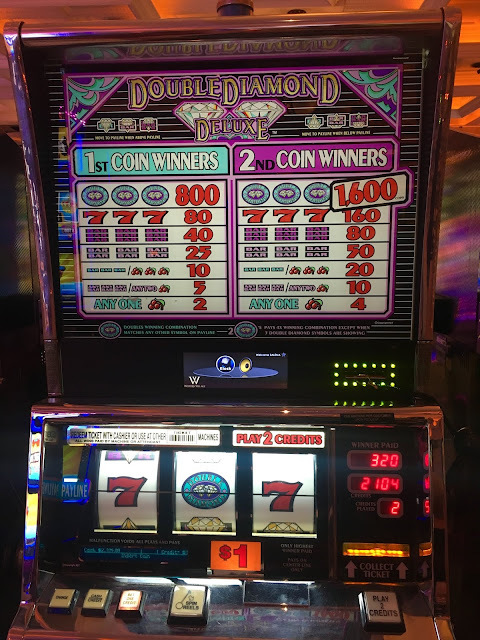 This is my favorite slot machine of all time - the Double Diamond Deluxe. Known as a straight slot or flat top slot machine, it's pretty basic. Three reels, one payline, one jackpot, no extra crazy bells and whistles. It's a classic old-school slot machine and I look for this particular machine in any casino I go to. There's usually one, even if it's tucked away in the back. I'll play quarters or dollars but I prefer the dollar machine, like this one. And I always play the max bet. I'm not really much of a gambler, but I do like a happy slot machine. I also don't really know how to play any of the tables games - blackjack, craps, roulette. Oh, I know how to get to 21 in blackjack, but the strategizing and the math stresses me out. That's Ed's game and he usually wins enough for us to get a hotel room and have dinner. I usually just pass time on "my" slot machine while he's off winning money elsewhere. I've gotten lucky in the past, winning over $700 one time and $2,500 another. The $2,500 win was awesome since I only sat down with $20. I totally scored on that one. Here you can see I'm up to $2,104 dollars. I started my play with $100. At one point, I was up to $2,400 dollars! I should have cashed out and left at that moment. Let's just say I didn't end my night with $2,400. But I sure had fun! Long live the one-armed bandit!